Budget airline Ryanair's appeal against a court judgement which found it was unlawful to charge a disabled passenger for a wheelchair is in its second day. Bob Ross, from Islington, London, won his case in January after being charged £18 to use a wheelchair at Stansted Airport, in Essex. Ryanair claims the airport imposed the charge and owner BAA should accept its responsibility for disabled people. Proceedings were delayed because the court had no wheelchair for Mr Ross. Mr Ross was supported in his case against Ryanair and Stansted Airport by the Disability Rights Commission who are seeking compensation for 35 other people. Mr Ross was awarded £1,336 compensation at the County Court, which included the £36 cost of hiring the wheelchair at the inward and outward journeys to France, the £20 cost of the tickets and £1,000 for injury to his feelings. Romie Tager QC, representing Ryanair, said it was not the airline that was discriminating against Mr Ross but the owner of Stansted Airport, BAA. He said Ryanair was prepared to absorb the cost of paying for someone to push a wheelchair through the airport even though this meant that, on the £10 one-way ticket to Perpignan which Mr Ross paid, the airline would make a loss. 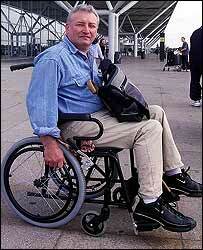 He said Ryanair had not charged Mr Ross for the wheelchair and pusher, it was the airport. "The responsible authority should be the airport operator which at Stansted was a "highly profitable" business which had made a £137m profit in the last year."